Make your product unmistakably yours! 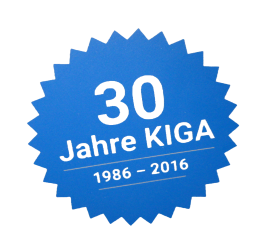 With almost all KIGA products, you have the option for an individual marking. Be it company logo or lettering, serial number, barcode, QR-code or important directions. Most markings are available in many colours. There are many reasons to mark your product. Besides matching the pallet to your company's corporate design, markings are used for distinctive classification, which minimises the chance of your product getting lost. Also, markings (like lettering or code) can carry hints for operational sequences and even help optimise these. Please tell us your wishes about color and position on the next side in box "additional text"